London’s funky and soulful reggae oufit Soothsayers recently dropped their seventh album Tradition, an eleven track set mashing together reggae, dub afrobeat, jazz and soul. And just as their other albums it’s a masterpiece mixing grand and creative instrumentals with vocal cuts and angelic harmonies. But Tradition is far from traditional reggae, even though all cuts are rooted in reggae. It’s like Fela Kuti and Bob Marley held a session in a cloudy London studio. The music has a strong sense of urgency and the lyrics are often politically charged addressing themes of inequality and injustice. And even though many tracks deal with the harsh reality many people face everyday Soothsayers also offers several slices of joy. Good Vibration is one such track, Nothing Can Stop Us, originally written for Cornell Campbell and featured on their previous album, is another. Soothsayers is in a league of their own with their fusion of reggae and afrobeat. Tradition is familiar, but at the same time something unique. Following last year’s double sided single Nothing Can Stop Us/Take Me High Soothsayers is back with a brand new four track EP where the band has reworked previously released cuts. This is their first release on their new label Wah Wah 45s and it bodes very well for future releases. As usual the songs are influenced by a broad variety of musical styles. Always with a reggae backbone though. The grooves are deep. The three part vocal harmonies are tight. And the horn arrangements are sublime with excellent interplay between each part. Soothsayers has created their own take on funky and soulful reggae where they let the rhythms speak and not being controlled by music boundaries. In classic Sizzla style the Original Gorgon Cornel Campbell drops his second album in just three weeks. The first one was the excellent roots album New Scroll for U.S. production trio Zion I Kings. The latest set Nothing Can Stop Us, recorded together with UK’s music collective Soothsayers, is a different affair compared to New Scroll. It’s a varied and ethereal set firmly grounded in reggae, but with significant influences from funk, afrobeat, dub and soul. Soothsayers have utilized the mixing skills courtesy of Yesking, Manasseh, Ticklah and Wrongtom and the sound is warm, hypnotic and swirling with lots of instruments, vocal parts and harmonies trading places in an eclectic, organic and breezy cocktail. The horns are sublime throughout, especially in Good Times and There’s A Fire, the piano in the uplifting Never Give Up is driving and Cornel Campbell’s high pitched tenor is soothing and a little rougher and raspier compared to his heydays in the 70s. 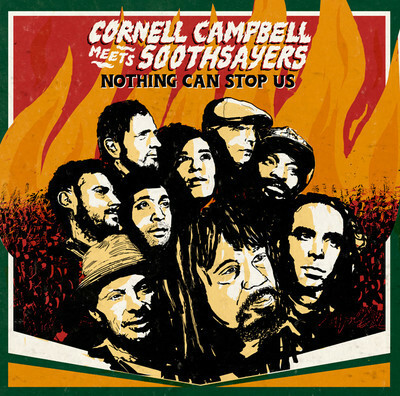 With an album like this there’s definitely no stopping to what can happen next in the careers of Cornel Campbell and Soothsayers. 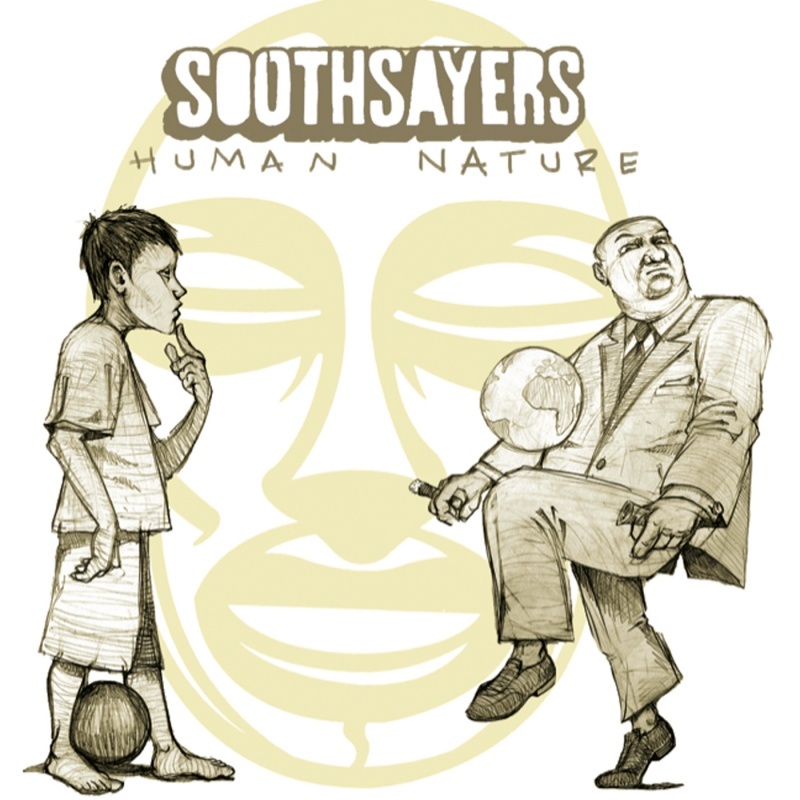 Human Nature – the fifth album from the UK’s roots and jazz outfit Soothsayers – has been preceded by a number of glorious tunes, and happily enough the full album manages to live up to, and even exceed, expectations. Where their previous vocal album One More Reason relied much on acclaimed guest vocalists, such as Michael Prophet and Johnny Clarke, this set is rather based around classic three part vocal harmonies courtesy of trumpeter Robin Hopcraft, saxophonist/clarinetist Idris Rahman and Julia Biel. The harmonies are unpolished and honest, andit fits the production – led by Nick Manasseh and Yesking – beautifully. Human Nature boasts a myriad of influences on both melodies and arrangements. 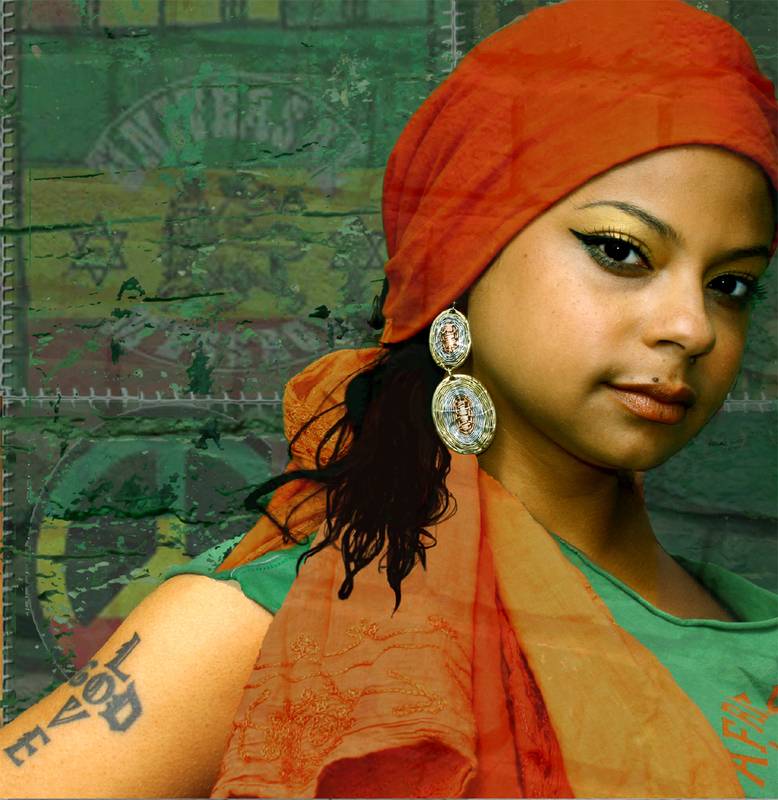 The backbone is reggae, but it’s spiced with dub, afro-beat, funk, country, pop, jazz, British folk music and soul. The warm harmony-rich sound was recorded in Prince Fatty’s analogue studio and is filled with alluring melancholy and striking horns, especially on One Day, an irresistible track with a melody aimed to make your eyes wet, and One More Reason, with a horns arrangement that would make Maceo Parker and Fred Wesley of The J.B.’s proud. Soothsayers also manage to make the much-versioned The Streets of London sound contemporary and fresh. The main ingredients are the gentle bass line, the luring organ, the heartbreaking horns and, of course, the purity of the intertwined voices. This masterpiece of an album is now available on CD and in digital formats. En blandning av soul, jazz och reggae. Så beskriver brittiska sångerskan Mellow Baku sin musik. I maj är hon aktuell med debutplattan Patchwork Prophecies, som hon ger ut helt på egen hand. Bortom hiphop influerad jamaicansk dancehall och elektrisk brittisk dubstep finns reggaeartister som hämtar inspiration från mjukare genrer som jazz och soul. Brittiska sångerskan Mellow Baku är en sådan. Hon växte upp i en kristen familj med en mamma som ofta och gärna sjöng både blues och jazz. – Jag växte upp i ett hem utan vare sig tv, radio eller populärmusik. Att sjunga och spela gitarr var därför naturligt för barnen. Det är det enda liv jag känner till, säger Mellow Baku. Hon var en av de starkast lysande stjärnorna på gruppen Soothsayers platta One More Reason från i fjol. Mellow Baku hade tuff konkurrens från andra gästartister, men sjöng ändå dreadsen av legender som Johnny Clarke, Michael Prophet och Linval Thompson. One More Reason är en både jazzig och bluesig historia. Något som passar Mellow Baku perfekt, eftersom även hennes egen musik drar åt det hållet. – Jag gillar det naturliga soundet man får om man använder bas, trummor och klaviatur. Det ska också helst vara akustisk bas eftersom det ger en varm känsla, menar Mellow Baku. Hon säger att reggaerytmer är oslagbara för att skapa ett tungt groove, men att jazz och soul ger mer spelrum. – Jazz och soul ger oändliga möjligheter att jobba kreativt med melodi och bas. Men jag är också inspirerad av världsmusik eftersom den är så mångsidig, berättar Mellow Baku. Hon gör det mesta själv och har en tydlig DIY-attityd. På debutplattan Patchwork Prophecies, som släpps i maj, har hon skrivit nästan allt material själv. Dessutom säger hon sig inte behöva något skivbolag i ryggen. – Det enda jag behöver är spelningar och möjligheten att sälja mina låtar. Jag har inte hittat något skivbolag ännu som gör det bättre än jag själv, utan att påverka kreativiteten. Men visst, hittar jag något som passar så vet man aldrig, säger Mellow Baku. På Patchwork Prophecies medverkar flera prominenta musiker, bland annat Steve Nutter och David Anderson, som tidigare spelat med skalegenden Laurel Aitken. Även hennes syster Michie One dyker upp på en av låtarna. Fram till nu har hon haft fullt upp med att spela in material till debuten och härnäst hägrar spelningar för att marknadsföra materialet. – De senaste fem åren har jag arbetat som sångerska för andra band på spelningar både live och i studio. Nu håller mitt bokningsbolag på att ordna spelningar för 2010 och 2011. Förhoppningsvis får jag möjlighet att även besöka Sverige, avslutar Mellow Baku.